There were names that rose to legendary proportions at the end of the nineteenth and beginning of the twentieth century, when Turkish and Kurdish marauding of Armenian peasantry was met with armed resistance by fedayees (freedom fighters). Kevork Chavoush was among the most prominent figures leading that struggle. He was born Kevork Atamian in 1870, in the village of Megtink, district of Psanats (Sasoun). In 1886 his family sent him to the school of the monastery of the Holy Apostles (Arakelots) in Moush. At school, he heard about Arabo (Arakel Mkhitarian, 1863-1893), one of the founders of the fedayee movement. He decided to join the movement in 1888. He left for Aleppo, where he spent two years working to buy a gun. In 1890 he returned to Sasoun. In 1892 Gurbo, the head of the neighbor village of Alizernani, betrayed Arabo and reported his location in the village of Pertag to the Turks, who managed to capture him despite heavy casualties. Kevork Chavoush punished Gurbo’s treason by killing him in his own home. After Arabo was killed in 1893, Kevork Chavoush participated actively in the first rebellion of Sasoun in 1893-1894. He was captured and condemned to 15 years of prison. However, he was able to escape from the prison of Bitlis in April 1896 and return to Sasoun, where he met legendary freedom fighter Antranig (1865-1927) and entered the ranks of the Armenian Revolutionary Federation. Serop Aghpiur (1864-1899), another famous fighter, was forced to leave his home in Khlat and move to Sasoun. Kevork Chavoush and Antranig, joined him with their own groups. Serop established certain rules among the fedayees. The first rule was that the fedayee was married to his weapon. He noticed that the Armenian villages were in enmity, since men from one village stole women from another, and declared that anyone doing such a thing would be severely punished. Kevork’s uncle, Ave, kidnapped a housekeeper at the monastery of the Holy Apostles. Serop left it to Kevork to decide the punishment. He was forced to kill his uncle, but depression led him to leave Serop’s battalion and isolate himself for a few days. In his absence, Serop was betrayed by a villager from Keghashen, also called Ave, who let the Turks know about Serop’s position and poisoned him. A troop of 2,000 Turks and Kurds soldiers surrounded the village of Gelieguzan. Aghpiur Serop, his son, and his brothers fell during the unequal battle. His wife Sose continued the fight, but was wounded and taken prisoner by Turkish chief Khalil bey, who beheaded Serop. His death did not go unpunished. In April 1900 Kevork Chavoush liquidated Ave and all other people implicated in the betrayal. In November a group of 30 fedayees, headed by Antranig and Kevork, ambushed Khalil bey and his 40 horsemen. They took Khalil prisoner and beheaded him. On November 1, 1901, Antranig and Kevork Chavoush, together with a group of 25 to 27 fighters, occupied the Holy Apostles monastery. The operation had been carefully planned to attract the attention of the foreign powers. A few days later, 3,000 Turkish soldiers besieged the monastery. During the siege, typhus declared among the Turks, who started negotiations on November 18. However, on the night of November 27 the fedayees managed to cut through the siege and disappear in the dark. 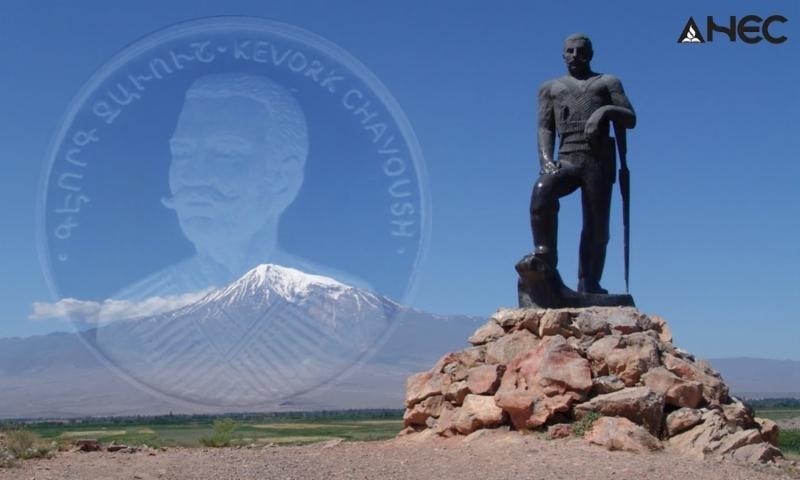 After the defeat of the second rebellion of Sasoun in 1904, Kevork Chavoush fought heroically in the plain of Moush with Antranig and other fedayees, and later he went to the region of Vaspurakan (Van). The meeting of local leaders of the Armenian Revolutionary Federation, held at the island of Aghtamar in September 1904, decided that a group of fighters return to Sasoun and continued the struggle against the Turkish authorities. Kevork became the A.R.F. representative in the region of Moush and Sasoun, and the leader of Armenian freedom fighters in the region from 1905-1907. Kevork Chavoush had left his sweetheart, Yeghso (Heghine), when he had entered the cause of freedom. However, she never ceased to love him, even after she was forced to get married. In 1905 she escaped her home and tried to see Kevork for the last time before taking her own life. He first rejected, but then his comrades of arms convinced him. They married the same day, breaking the rule of fedayee etiquette, and had a son called Vartkes. On May 25, 1907, an unequal fight broke in the village of Souloukh, in the plain of Moush. Eighty fedayees fought against a 2000-strong Turkish troop. The Turkish troops gave 120 dead and 110 wounded. The Armenian losses were seven dead and 21 wounded. Most importantly, however, Kevork Chavoush was mortally wounded in the fight. He passed away on May 27. After his death, the Turks tried to kill his wife and son, but his comrades saved their lives. Kevork Chavoush’s life and exploits became the material for songs and novels. Like the rest of the fedayee movement, his name was banned for many years in Soviet Armenia. In the 1960s his relative Kevork Melkonian managed to install his statue in the village of Ashnag, whose population had its roots in Sasoun, complemented by a museum he inaugurated in the 1980s. After the independence of Armenia, other statues were inaugurated in Yerevan, Artashat, Jermuk, and the village of Lousarat.